____I have submitted my VONAPP (Veteran’s Online Application) online. ____I have NOT submitted my VONAPP online, but plan to do so in the near future. Have you ever used your VA benefits at another school? 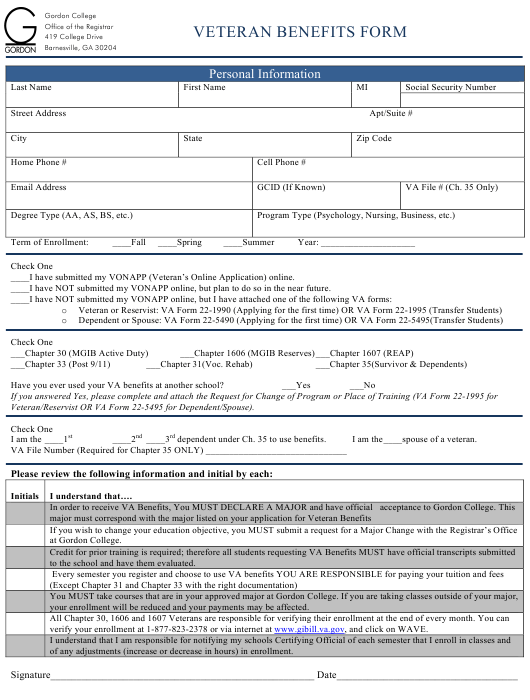 Veteran/Reservist OR VA Form 22-5495 for Dependent/Spouse). dependent under Ch. 35 to use benefits. I am the ____spouse of a veteran. to the school and have them evaluated. your enrollment will be reduced and your payments may be affected. verify your enrollment at 1-877-823-2378 or via internet at www.gibill.va.gov, and click on WAVE. of any adjustments (increase or decrease in hours) in enrollment.